The etymology of this word arises from two Latin words; [cribrum], meaning "a sieve" and [forma], meaning "shape" or "shaped-like". The word [cribriform] means then "sieve-like" or "perforated with a large number or holes". There are places in the body where the term applies. 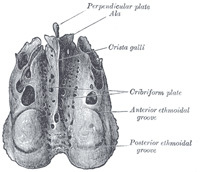 Examples are the cribriform plate (lamina cribrosa), a sieve-like region found in the superior aspect of the ethmoid bone (see accompanying image) , described in detail by Gabrielle Fallopius. The olfactory nerves, extensions of the olfactory, bulb pass through the cribriform plate on their way to the olfactory epithelium, an area of the mucosa in the superior aspect of the nose. Another is the cribriform fascia (Hesselbach's fascia) on the anterosuperior aspect of the thigh through which passes the greater saphenous vein and other structures.